Design: Orchid & Butterfly. (Korean Style Mother of Pearl Case). Color: Multi-Color (See Photo). Up for sale are new Oakley Camo Green lanyards. Roof Tile Pattern on. (Korean Style Mother of Pearl Case). Color: Multi Color (See Photo). One Georgia Bulldogs Bulldog Retractable badge reel with alligator clip. W103 MOSSY OAK 1986 CAMO ID HOLDER FAUX LEATHER SLIM WALLET DESIGN & MAGNETIC MONEY CLIP. (Camouflage patterns may vary). 1 ID Holder. Magnet Money Clip. Handmade customised crocodile skin ID card/Badge holder. Material: Niloticus crocodile / swift calf leather. Size: 10cm x 7cm. (Colorful Animals Pictures on the cover of case). (Korean Style Mother of Pearl Case). Colorful Design of various objects. Color: Multi Color (See Photo). Genuine Python Leather Passport Holder. Material : Genuine Python Skin. 1 Passport Holder. We will try to resolve your problems. Color : Black. 4 Credit Card Slots. 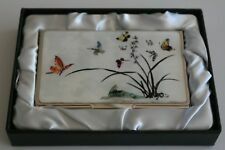 (Korean Style Mother of Pearl Case). Colorful Design of various objects. Color: Multi Colors (See Photo). Easily fits in your hand, shirt pocket, purse, or pants pocket. · Created from Burl Walnut and Birdseye Maple woods. · Fold to display position and use to hold kitchen recipes. Seven expandable pockets;aluminum outer shell; ABS plastic interior; PVC plastic divider. Surface Waterproof. Color:Yellow, Red,Purple,Black, Green,Blue.Silver. 1 x Aluminum Credit Card Holder.